Using our Stacking tool found within our Player Models, this piece will identify some of the top stacks of the weekend. Check out our Correlations page as well to find hidden edges in stacking positions and games. Fresh off of getting dominated by Alvin Kamara, the Giants will be facing another elite two-way running back in McCaffrey. Linebackers Alec Ogletree and Ray-Ray Armstrong have allowed a combined 85% catch rate (29-of-34) through the first four games of the season and should have fits covering the second-year pro out of Stanford. The Giants have also struggled greatly against rushing quarterbacks. 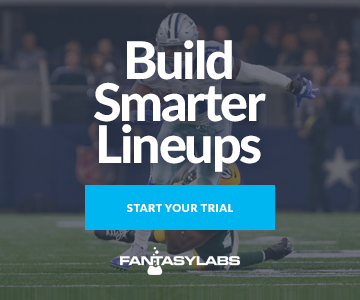 According to the FantasyLabs Trends Tool, the Giants are allowing a whopping 7.39 average plus/minus against quarterbacks averaging 20 yards or more on the ground. A quick look at Newton’s correlations shows that he and McCaffrey have a correlation of 0.74 in their 20 games played together. McCaffrey has a 28% target share this season. This game has a great chance to go overlooked, as it has an over/under of just 44.5 (you can find updated odds here). There are currently six games on the main slate with a projected total of 49 or more. Morris saw limited snaps last week because of a knee injury, but has still out-paced Matt Breida in carries 44-41 on the season. Perhaps more importantly, Morris has earned 70% of the carries inside of the 10 yard-line. The 49ers are 4.5-point home favorites against Arizona, and home favorites seeing the kind of volume Morris is have traditionally done very well. Breida was limited in practice on Wednesday after being a game-time decision in Week 4. Any limitations would improve Morris’ chance of seeing a quality workload. San Francisco will be taking on rookie quarterback Josh Rosen. Since 2014, rookie quarterbacks on the road own a 7.8% sack rate and 2.9% interception rate. As a reference, the league average in those statistics were 6.4% and 2.5% respectively for 2017. Since 2016, Stafford has absolutely owned the Packers. The primary beneficiary of Stafford’s awesome play has been Jones. While Kenny Golladay has absorbed more targets than he did last season, Jones is still leading the team in air yards. There is only a seven point difference in the Weighted Opportunity Ratings of Jones and team-leader Golden Tate. Despite this, Jones is $2,000 less than Tate and $1,300 less than Golladay on DraftKings, representing an excellent value opportunity. The Packers are banged up at receiver right now. Randall Cobb still isn’t practicing after injuring his hamstring last week, while Geronimo Allison is in concussion protocol. If either player can’t suit up, it gives Adams a target boost. If both are out, he should be the clear focal point of the passing game. Adams has the highest correlation of any Packers player with Aaron Rodgers, coming in at 0.80. Anytime Roethlisberger is playing at home, it is likely a good idea to consider him in a stack. The Steelers passing game very clearly runs though Brown and Smith-Schuster, with target shares of 28.5% and 26.3% respectively. This game has the highest over/under on the weekend, coming in at 57.5. According to our NFL Correlations page, the correlation between a quarterback and his top two receivers jumps from 0.50 and 0.46 respectively to 0.84 and 0.64 for games with a total of at least 55. Pittsburgh has been getting murdered by tight ends to start 2018. The 10 tight ends they have faced this season are averaging a plus/minus of 6.00, and own an 80% consistency rating. Hooper has only seen 15 targets this season, but had at least four in each of the first three games, and has played the most snaps of any Falcons offensive skill player. He owns a career 67% catch rate and 28% touchdown rate inside the red zone. Credit: Charles LeClaire-USA TODAY Sports. Pictured: Pittsburgh Steelers quarterback Ben Roethlisberger (7) and wide receiver Antonio Brown (84).